Roughly 80% of the matter in the universe is made up of a theoretical kind of material that is invisible to the naked eyes. It is called dark matter. This fact provides an interesting topic for a conversation over dinner. A similar situation can exist inside an enterprise as far as content is concerned. Most of the content remains dark due to lack of effective consumption. Now it is no longer just an interesting dinner conversation topic but a serious issue to be addressed. Ineffective content utilization can lock up knowledge in silos, hampering sales productivity. Content plays a crucial role in nurturing customer relationships. Providing the right information at the right time makes a sales person a hero in the eyes of the customer. So why does most of the content remain underutilized? There are two main reasons for ineffective content utilization: awareness about the existence of content and awareness about situations wherein it can be used. Unfortunately, the current methods and tools solve only one of the issues or the other but not both. Cloud storage and file sync-share systems can make people aware of a new document available in a folder. This document can be made accessible from various devices. However, the burden of making sure the content reaches the intended audience falls on each individual. One has to think hard about where this document can be used. For example, if Marketing generates a new case study document, the sales person now has to know which customers that document should be sent to. If that intelligence is not available, the document will not reach the intended target audience. On the other hand, there are systems that can suggest a document to be used in a particular scenario. However, such systems require the document to be curated. The person creating the document needs to add appropriate tags and categorize the document. In short, the person needs to define the scenarios where in the document can get used and that is a huge problem. Not all people will do this correctly. If the tagging and categorization is not done properly, the system simply fails. What we need is a system, which can recommend documents from existing content repositories without any additional burden of curating. The repositories can exist in cloud storage making the content accessible from anywhere. Instead of relying on curating, the documents get recommended based on the sales person’s content consumption and conversation patterns. The content creator can focus on creating meaningful content without having to worry about the content reaching the target audience. The system determines the targets and recommends the content. Furthermore, the content should get recommended in relevant context to make it more meaningful. Let us take the previous example of marketing collateral of a case study. If this case study gets automatically recommended to a sales person to be shared with a customer right in the context of an exchange he/she is having with a customer, it is quite impactful. 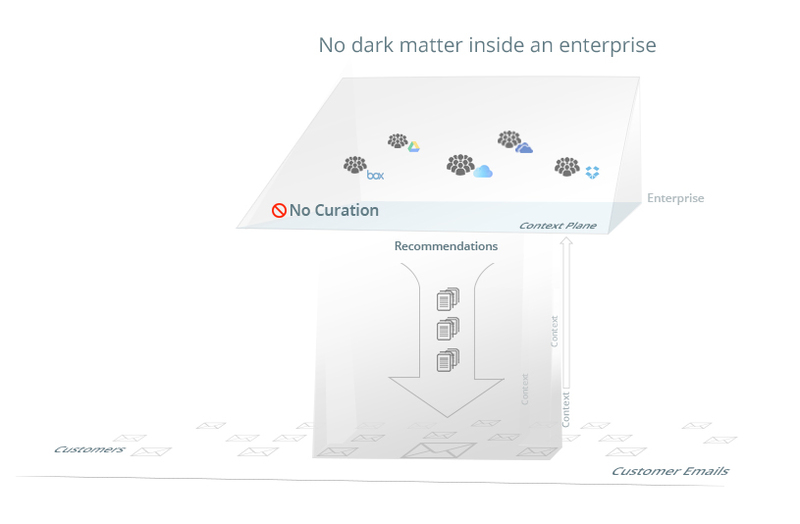 Such effective content utilization, driven by the intelligence in the system, will not leave any dark matter inside an enterprise.